The Golden State Warriors continue their quest for the ultimate season having captured the NBA Western Conference Championship in 7 games versus the Thunder. Now, after setting the standard for most wins in a regular season, the Warriors look to add another NBA title. To celebrate the team's 2015-16 Conference Championship we are pleased to release this very special limited edition Wood Grain Finish Commemorative Basketball. 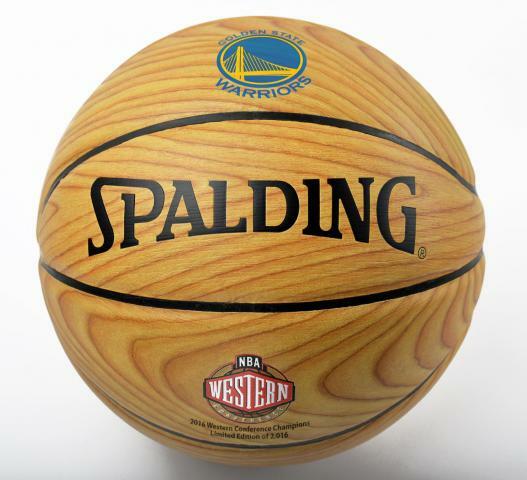 This special commemorative collectible is an actual basketball with a faux wood-grain style exterior. The "hard court" look is amazing and will look fantastic displayed in your home or office. This ball prominently features the Golden State Warriors logo. This full size replica basketball makes a beautiful addition to any Warrior fan's team collection. Add this unique piece to your display today before they are gone. Due to the limited nature of this offer we must charge your credit card for the full amount immediately upon taking your order. This policy ensures we reserve a commemorative wood grain ball for you. This ball is not game used. Please allow 4 to 6 weeks for delivery. 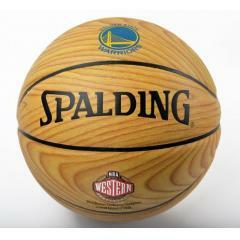 Warriors Western Conference Champs Wood Grain Commemorative Basketball $69.95 Sold Out!